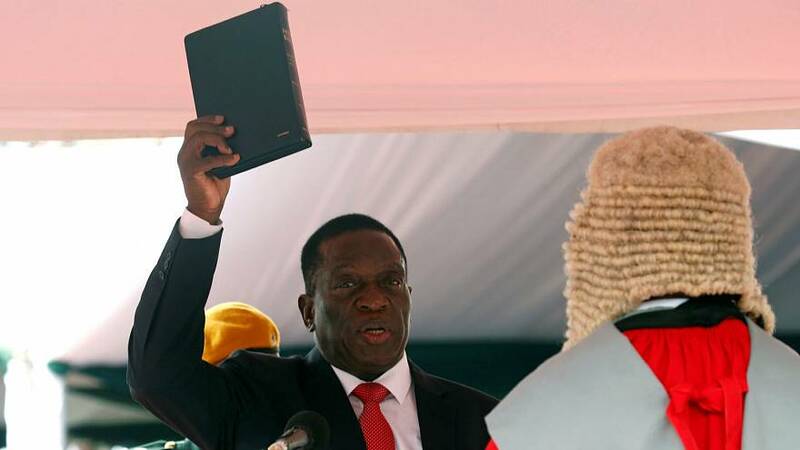 Emmerson Mnangagwa has been sworn in as President of Zimbabwe to loud cheers from a packed national stadium in Harare. The swearing-in brings down the final curtain on the almost four-decades-rule of Robert Mugabe. 75-year-old Mnanagagwa promised that elections would be held next year as scheduled and steps would be taken to revive the economy. Mnangagwa also vowed to respect the constitution and improve citzens’ rights. “I am required to serve our country as the president of all citizens, regardless of colour, creed, religion, tribe or political affiliation,” he said in a speech. He also described the “voice of the people” as the “voice of God”. But he has a lot of convincing to do. Mnangagwa has been the right-hand man of Mugabe for years and is the country’s former security chief. Critics say a lot of the harsh policies of Mugabe can also be traced back to Mnangagwa. The former vice president was nominated for president by the ruling ZANU-PF party after Mugabe resigned last week. The military took control of the country after Mnangagwa was sacked by Mugabe, raising suspicions that the 93-year-old was planning to install his unpopular wife Grace in the presidency. Mnangagwa has also promised that Mugabe and his family will be kept safe. It is also reported that Mugabe has been given guarantees that he will not face any court action over past actions. The fired finance minister, Ignatius Chombo, is alleging that he was beaten while in military custody last week. His lawyer, Lovemore Madhuku, told the Reuters news agency that Chombo was blindfolded. “It was a very brutal and draconian way of dealing with opponents,” he said. Chombo is in hospital with various injuries.